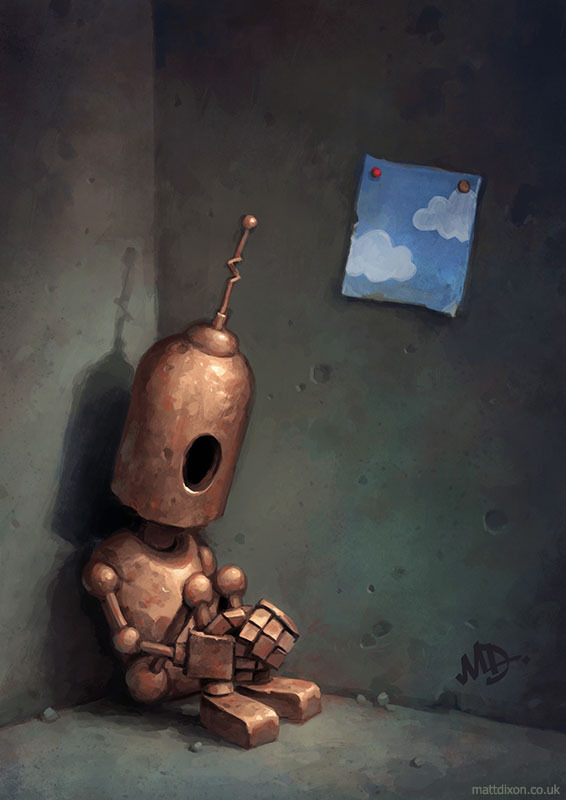 The Kickstarter campaign for my newe book of robot art, Transmissions 5, has now ended. 569 backers helped the project reach 1125% of the funding goal. Amazing! Thanks to everyone who backed the project or supported by helping to spread the word. This work really couldn’t happen without your incredible support. Pre-orders are now open on the Transmissions page. Pre-ordered books should despatch in May once all Kickstarter rewards have been fulfilled. Now it’s time for me to have a little rest after a busy few weeks! Thanks again everyone..! When I completed the first Transmissions painting in 2006 I had no idea what it would lead to. To be talking about the possibility of a fifth book is amazing, and it’s all thanks to the people who have supported my work over the years. None of these images would exist without it. If you’ve supported the work, you’re as much a part of Transmissions as I am. 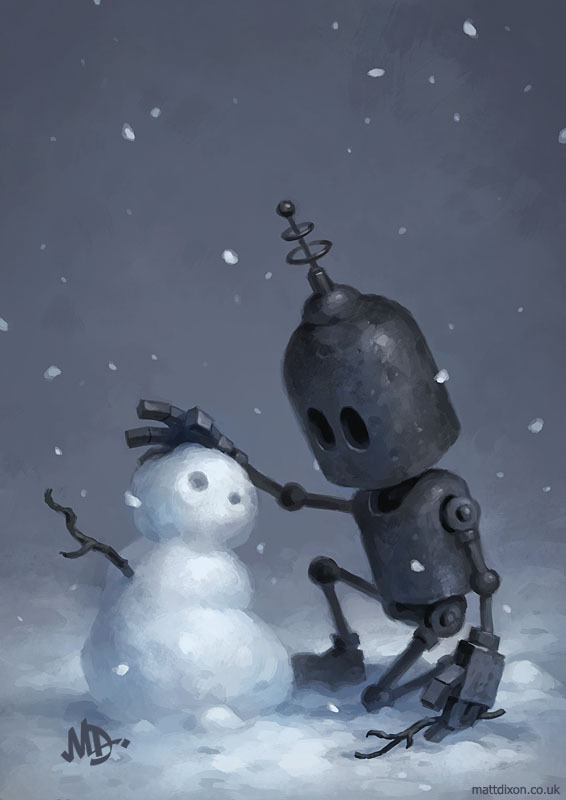 Those rusty little robots and I am very grateful. Thank you. I hope you enjoy the new work. Whether you choose to back the project or not, you can help things along by sharing the campaign on social media. People can only support the project if they know about it! The Kickstarter page has buttons to quickly and easily share to Twitter and Facebook, you can share my social media posts from Twitter, Instagram or Facebook, or make your own post using the URLs below. Anything you can do to help spread the word will make a difference! 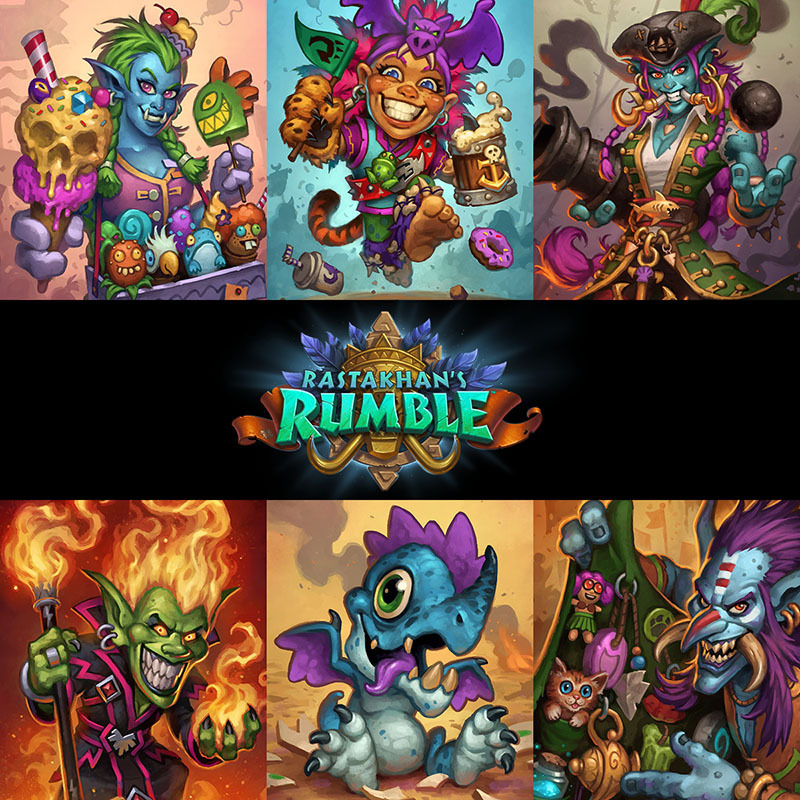 Signed prints of my work for Hearthstone's latest expansion, Rastakhan’s Rumble, are now available. Prints are A4 size ( 210 x 297mm ) on high quality glossy paper and ship worldwide in sturdy cardboard tubes. Find Captain Hooktusk, Helpless Hatchling, Griftah and friends on the Hearthstone page. Or just click the image to go shopping! I’m back from my short year end hibernation and ready to tackle 2019. 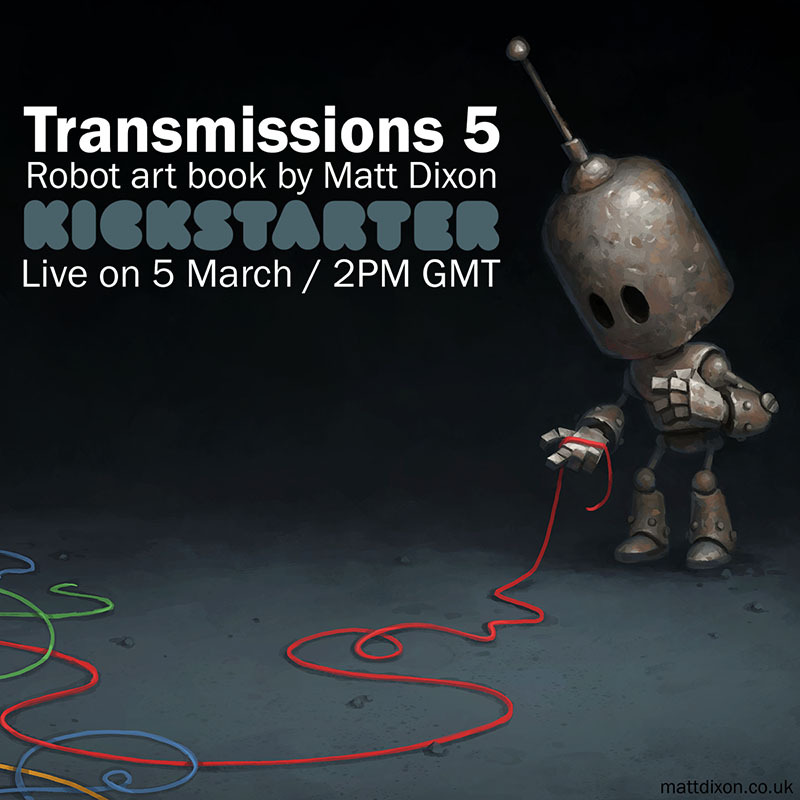 There’s a very busy twelve months ahead: Transmissions 5, a new collection of my robot artwork, will be heading to Kickstarter in the spring. 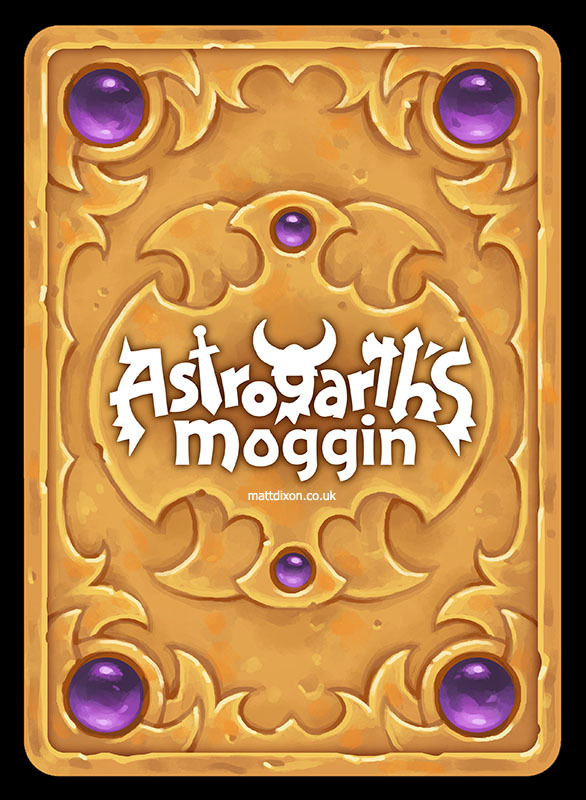 In the summer, Astrogarth’s Moggin, a project that I’ve been working on for almost three years will finally be revealed. My final personal project of the year will be the 2020 Transmissions calendar in autumn. Between all that I’m loaded up with some exciting illustration work too, so my pen-wielding appendage should be getting plenty of exercise. Sadly, such a packed diary means I can’t fit in everything I would like to, so I’ve decided that I won’t be doing any conventions this year. The bigger events are now over three days which means they take quite a bite out of the schedule and are more expensive to attend. As my eyesight gets worse, I also find the convention environment requires much more energy that it used to. I’d like to thank everyone who has supported me at conventions over the last decade and more; it’s deeply appreciated. Time to get back to work on some more robots for Transmissions 5. I hope the new year brings everyone peace, happiness and creativity in abundance. Cheers! I am now on my end of year break. The shop will remain open but no orders will despatch until I return to work on January 4. Thanks to everyone who has supported my art this year! As the festive season moves inexorably closer, I should mention that I’ll be making just three more shipping runs before I take an extended break over the year end. If you’re looking to order something as a Christmas gift, please consider placing your order as soon as possible. My last run will be on December 19 but I would suggest any orders for delivery outisde the UK are in by December 12 to allow good time for delivery. Any custom orders ( large prints or sketches ) will need to be in by December 6. I’ve added a new print to the Transmissions page, available in A4 and A3 sizes. ‘Sorrow’ was among the last images created for the Transmissions 4 book and one of my favourites from that collection. I’ve been having fun with Inktober this month. It’s been great to produce some traditional work and making a bit of space each day for some work that can just be about fun and experimentation is very rewarding. Some of these drawings are now available for sale. You can find them in the Misc section of the site. I’ve also made some robot sketches available in the Transmissions section. A new paladin hero skin is now available in Hearthstone. Please say hello ( hello, hello ) to Sir Annoy-O! It was great to be able to revisit this little guy and extend his family tree a little further. For anyone who hasn’t already had enough of this annoying chap, perhaps you’d be interested in seeing how Sir Annoy-O evolved? Above you can see the inital sketches for Sir Annoy-O, from first concept at the top to the approved design at the bottom. The setting for the artwork was to be Stormwinid, so my first idea was to have Annoy-O dressed up in a collection of Stormwind and Alliance gear. Like he’d raided the Stormwind souvenir shop. This was judged insufficiently annoying and, looking back, the pose is quite static; he’s just standing there. One of the original Annoy-o-tron’s signatures are his horn and bell. He’s a noisy devil. So the next step was to consider options to give Sir Annoy-O improved noise making capabilities. What is the most annoying nusical instrument? Bagpipes, of course. I really liked the idea of giving the Annoy-Os Scottish heritage but this too failed to acheive a satisfactory level of annoyance. I had the idea to try and work in a squeaky hammer, a call out to the preferred weapon of his newly adopted paladin brothers and sisters, and while drawing that in had the idea of adding a marching drum. Then everything just fell into place, the drum head to show off the smiley face from the original Annoyotron and the one man band feel of the design suits the Annoy-O vibe perfectly. That design was approved and was worked up to the final art with no significant changes, other than the addition of some extra honkers on the side of the drum. If you want to play with Sir Annoy-O, he’s available along with a pack bundle during the Hallow’s End event which runs until the end of October. As featured in my latest book of robot art, Transmissions 4. As Halloween is fast approaching I thought this would be an opportune moment to offer up some zombies. 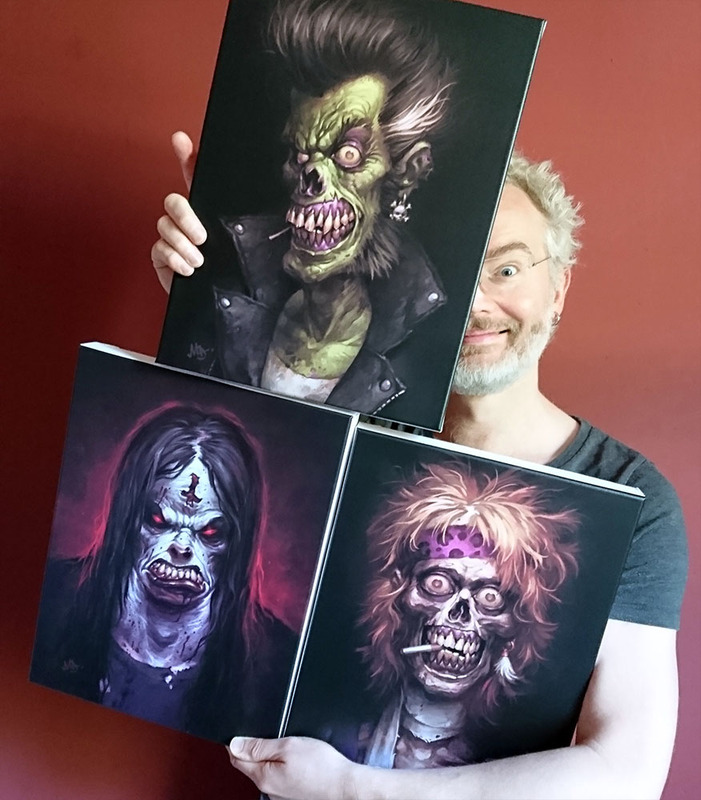 These canvas prints are ex-display and have some slight blemishes but are offered with horrifyingly brutal discounts to reflect their imperfections. Free UK shipping too! UK shipping only due to size. Find them in the newly added ‘misc’ category above. More to be added there soon..! 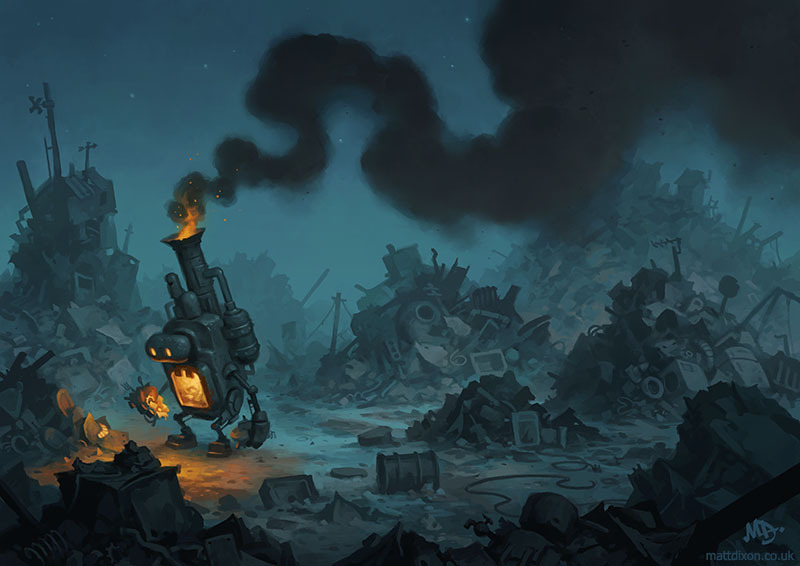 Signed prints of my work for Hearthstone's latest expansion, The Boomsday Project, are now available. Prints are A4 size ( 210 x 297mm ) on high quality glossy paper and ship worldwide in sturdy cardboard tubes. Click the image to go shopping! Shopping for science! I've just taken delivery of a huge pile of boxes. The 2019 Transmissions calendars are here! Many thanks to all who backed the Kickstarter campaign. This wouldn't be possible without your support. Kickstarter rewards should begin shipping out next week. Pre-orders will despatch once all Kickstarter rewards have been sent. The calendars will then go on general sale. There's still time to get in on the pre-orders here! This was one of the last pieces I completed for the Transmissions 4 book and is one of my favourite Transmissions images to date. Prints of this image are now available on the Transmissions page. Annoy-o-module, for the new Hearthstone expansion, The Boomsday Project. 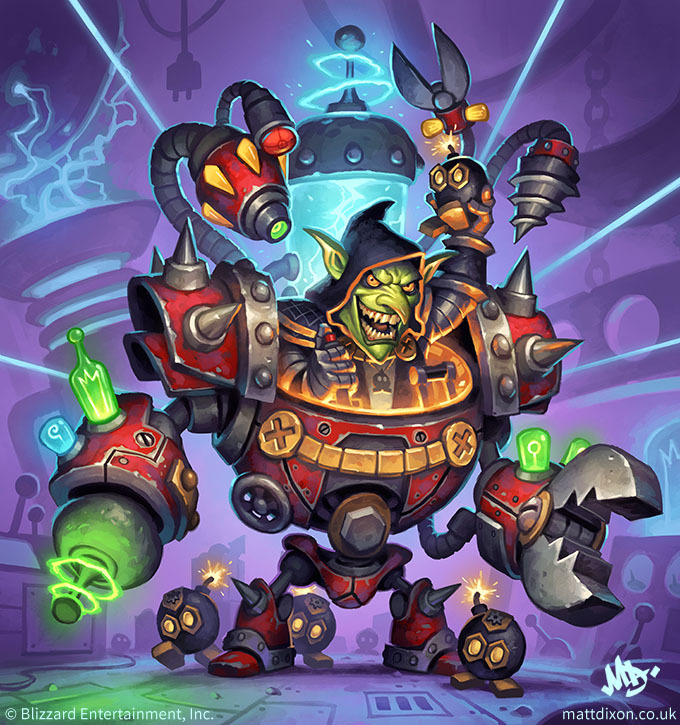 I've painted over 100 pieces of art for Hearthstone but my favourite is one of the first I produced, Annoy-o-tron, so it's always a pleasure to be asked to extend the little guy's family. First there was the troubled step-cousin, Psych-o-tron. Now there's baby brother, Annoy-o-module, and imagine my delight when I was also given the opportunity to paint his creator! 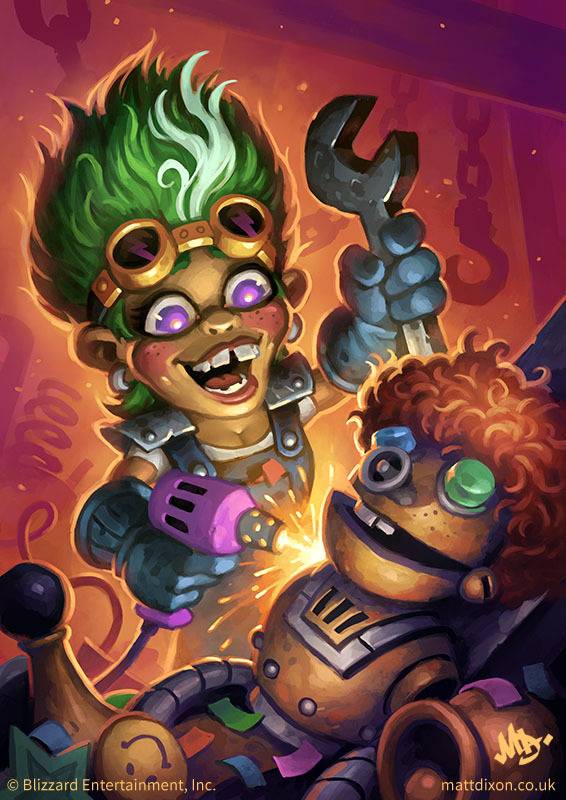 Meet Annoy-o-tron's Mom, Giggling Inventor! Here's hoping I have the chance to explore this wacky family tree further in the future..! 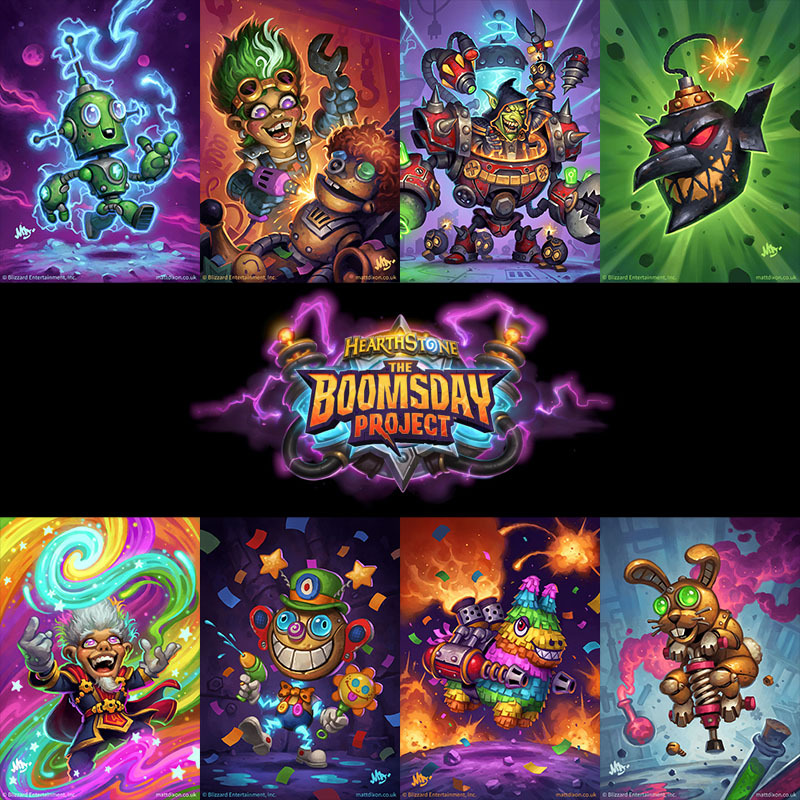 The Boomsday Project, Hearthstone's latest expansion, is soon to be released! This was a really fun set to work on, especially as I had the opportunity to concept the appearance of Dr. Boom for this set and to paint his hero card art. The theme was super cool. Any expansion that gives me the chance to draw a mechanical rabbit on a pogo stick, a weaponised piñata and show the lunatic who invented our old friend Annoy-o-tron is all right by me! 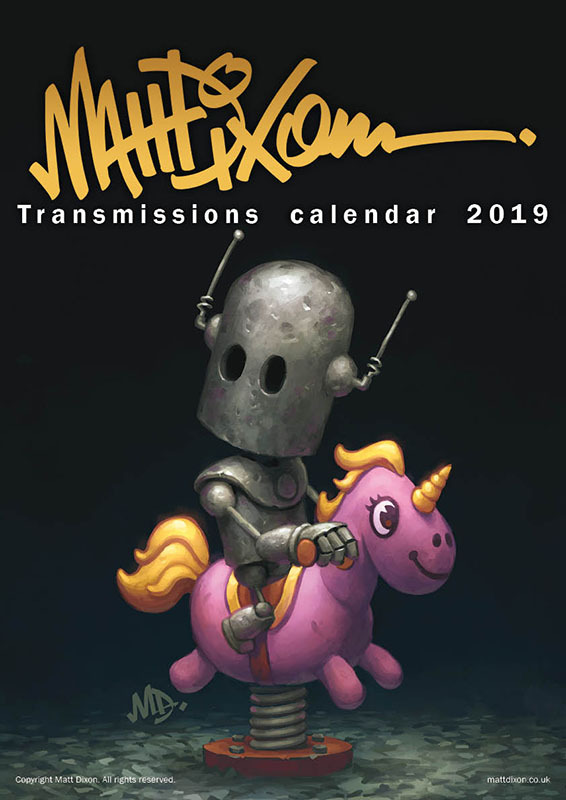 The Kickstarter campaign for my 2019 Transmissions calendar has now ended. The project was over 1000% funded with the help of more than 250 backers. Thanks to everyone who supported the project! All content copyright Matt Dixon unless otherwise stated. All rights reserved.